SDORC held its annual election at our May meeting and we have a complete board of directors: Audrey Mason as VP, Rob Smith as Treasurer, Denise Jones as Secretary, Jim McGarvie with Communications, Lindsey Gabriels with Membership, John Ellis with Legislation, and I am staying on as President. I thank these dedicated individuals for helping us keep our favorite sport alive. We also have three dedicated gentleman who have been attending meetings and events for many years: Rick Moore, Jim Ness and Doug McPheeters. Doug has been our election officer for many years and also coordinates our highway cleanups. All three make efforts to attend meetings and special events, and help tremendously with our Fun Run. Having these guys around makes this work much more enjoyable. I recently wrote about Oceano Dunes and the State Parks plan—which would have reduced airborne particulate by 30%—that was rejected by the Air Pollution Control District (APCD). On April 30 there was another meeting about the dunes and air pollution, at which Parks offered a plan that would reduce particulate by 50%. This was accepted by the APCD and Parks has five years to implement the reduction. Unfortunately, many acres will be closed to meet this goal. I understand that CORVA and possibly Friends of Oceano Dunes may take legal action on this. Off-Road Lobby Day took place recently in Sacramento. I flew up for the day for appointments that I had made with San Diego County representatives. I told each how we oppose SB1316 because it unfairly sets up the land purchased to expand Carnegie SVRA to be sold. I asked for AB1874, the bill to stop the transfer of OHV money to the general fund, to be supported. The problem with AB1874 is it has been moved to Suspense. Suspense is where bills that have a fiscal impact on the state go to be decided on after the budget is sorted out. The way bills come out of Suspense is kind of murky. I don’t know if this bill will make it, but the fact that the state has a budget surplus this year should help. CORVA had its annual meeting at Jawbone Canyon and I got to see a little of how Friends of Jawbone (FoJ) operates. It built a large building to house all its equipment, including nine trucks, a skip loader and other pieces. FoJ has 16 people on payroll working daily out in the desert and in the visitor’s center. You can also see Bob, the 120-year-old desert tortoise, in his area. Jawbone Canyon has many huge hillclimb trails. If that is your thing, it’s worth a trek up there. El Mirage OHV area had a recent cleanup I attended. Like Jawbone, this is a BLM open area. While there are plenty of trails to ride/drive, the highlight of the area is the lake bed. It is huge and very flat. You could do lazy 100-mph circles in a Cadillac out there. I rode the perimeter of the lake bed cruising in top gear on my ATC200x and it took about half an hour. Six times a year the Southern California Timing Association (SCTA) (http://www.scta-bni.org) holds Land Speed Racing events there, something I intend to watch soon. 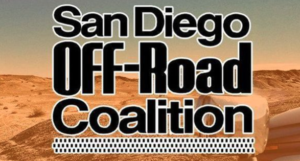 SDORC has a Meetup (https://www.meetup.com/SanDiegoOffRoadCoalitionSDORC) and will be having some fun events, like campouts in the desert. If you do Meetup, look us up. If you don’t know what it is, you might be in for some fun. We are working on our next Lost Lizard Fun Run. Seems like we just had our last one, but it is time to plan for the next. Mark your calendar for November 3. I rode my dirt bike from Pine Valley to Corral Canyon recently and came across Cleveland National Forest employee Richard Tull working on a trail. We talked for a while and he said riders shouldn’t go on closed trails, and if they do, they shouldn’t use GoPro cameras, and if they do, they shouldn’t post the video on YouTube, and if they do, they really shouldn’t show their license plates in the video. The California Air Resources Board (CARB) recently had a meeting about red sticker dirt bikes. In a nutshell, they said that they intend to end the red sticker program, meaning that the more polluting off-road racing motorcycles will no longer be allowed to be used on public land. They plan to phase in the new rules over the coming years; it will not be an overnight change. A consolation is that all the current red sticker bikes will be “grandfathered” into the green sticker rules; they will not be restricted to certain riding areas or seasons. The bad news is that while new racing bikes can still be sold and used in actual races and on private property, they will not be allowed on public land. This will seriously hurt sales of racing motorcycles in California. Racers who buy new racing bikes will have a hard time selling them since the new owners won’t be able to take them on public property except for races. CARB has announced their intentions, but the exact way they will implement this is being decided. CARB is accepting comments on ending the red sticker program until June 15. If you would like more info or to comment, go to the CARB website or contact me at info@sdorc.org.